The eastern half of the U.S. was chosen as the validation site for the satellite derived surface temperature product. This area spans from 100°W to the eastern seaboard and from the Canadian border to the Gulf of Mexico. The complex topography of the western half of the U.S. excludes that region because rapid elevation changes cause large discrepancies between the point source in situ data and the areal integrated SSM/I data. Our study area contains a moderate density of quality in situ stations with temperature measurements (Fig. 1). Over a year, the surface conditions within this region consist of wet and dry land covered by trees, grass, cities, snow, ice and dead vegetation in a moderate elevation range (sea level to 1600 meters). Water surfaces are excluded due to their very low emissivity. This low emissivity allows other physical parameters to increase their contribution in the signal, and introduces noise in the final product. For instance, wind across a water surface increases the emissivity and therefore the observed temperature. The concentration of atmospheric water vapor also alters the observed temperature over a water surface. For these reasons, the high polarization difference of water at 19 GHz was used to identify surfaces that were primarily water and remove them from the data sets. Due to the low resolution of the instrument: rivers, ponds, and small lakes all contribute to the integrated signal. As long as the majority of the radiating surface is the dry earth or a vegetated surface, those observations remain in the analysis. However, coastal margins, large lakes and seas are filtered out either through a moderate resolution land-sea mask or the polarization difference at 19 GHz. As mentioned above, no a priori information is used to identify surface type or the background emissivity. For each observation of every orbit, the seven SSM/I channel measurements provide all the information used to identify the surface type and make an emissivity correction. 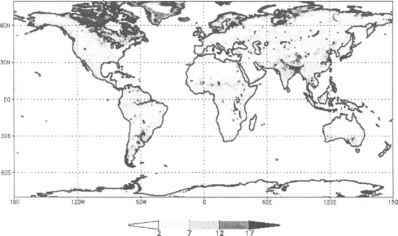 It took a sophisticated expert to make a dynamic determination of the land and/or atmospheric conditions for each time and place, and identify the surface emissivity. This system calculates the change of surface emissivity due the percentage of liquid water on the radiating surface, at the time of the satellite over flight. The in situ stations monitor the microclimate in a shelter 2 meters above a grass surface. Tests have shown that these instruments have an accuracy of 0.1°C (Nadolski 1992) at a specific point. On the other hand, the SSM/I integrates the entire footprint (12.5 to 60 km) at each of the four frequencies into an average brightness temperature. The SSM/I measurements mainly emanate from the radiating surface, which can be barren and/or vegetated though there is a small atmospheric contribution at the 22 and 85 GHz water vapor frequencies. 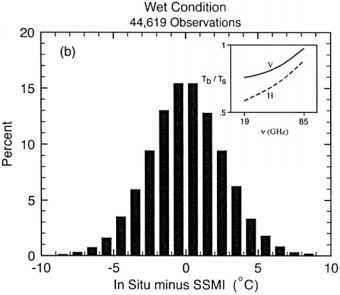 For the most accurate calibration between each SSM/I signal and the shelter height temperature at a given location, only hourly surface observations within one hour of the SSM/I overpass of 1/3° square occupied by the in situ station were used. The following steps elucidate the methodology and procedures to simulate the shelter height temperatures from the SSM/I channel measurements. We begin by identifying a surface type (e.g. desert, wet surface, snow cover) from the theoretical and empirical relationships between the seven channel measurements. This analysis also allows us to identify which microwave signatures (i.e. scattering, emission and/or polarization) should be used in a regression equation to minimize the standard error between the in situ and SSM/I derived surface temperature. A regression equation for each surface type uses the unique relationship between the SSM/I channel measurements to make dynamic emissivity adjustments. where f0 /i,...,/n are functions that contain brightness temperatures, scattering over frequency ranges, or polarization difference at given frequencies. The proportionality constants (/3 through f3„) account for the different contributions of the various characteristics. Furthermore, the fields of view at the various frequencies range from 60 Km at 19 GHz to 12.5 Km at 85 GHz, and the proportionality constants in (2) partially account for this variation as well. from the eastern half of the United States. The results of this study introduces significant improvements over the previous paper (Basist et al. 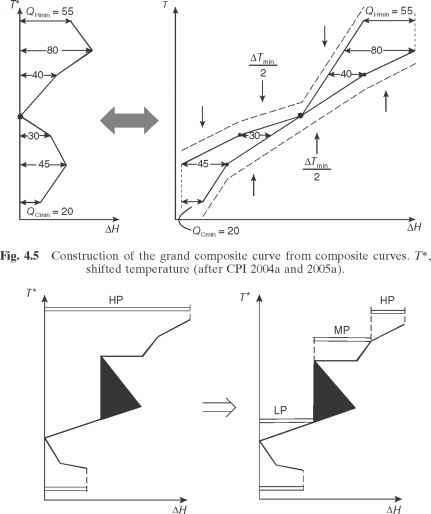 1998), since the additional analyses expanded the number of surface types for which emissivity adjustments are derived. The new proportionality coefficients have increased the explained variance and reduced the error of the SSM/I derived temperature product. Hourly temperature measurements from the 'First Order' network were compared to the corresponding SSM/I derived temperature at the time of the DMSP satellite overpass. The SSM/I channel measurements for these comparisons came from the descending (morning) pass of the F11 satellite because this satellite has the most stable orbit of the three satellites (see section 4) and the near surface boundary layer temperature approaches equilibrium with the skin temperature in the early morning (Betts and Ball 1995). Figure 2 presents a histogram of the error characteristic of the derived surface temperature once emissivity is corrected for water in the radiating surface. The distribution, based on 44,619 observation, is approximately guassian, with a average error 0.02°C. The kurtosis is extremely small, meaning that the distribution is bunched near zero error, and there is nominal skewness, indicating that the distribution is symmetrical around the mean. Figure 3 shows the calculated wetness index over the globe for July 1997. Note the high values over the Figure 3. A map of of the Basist wetness index (BWI) for the globe during the month of July 1999. The highest wetness values occur over tundra, swamps, and broad river valleys, moderate values in the moist areas of the globe, and values below 2 in the dry regions or where dense vegetation hides the ground. When these adjustments are added directly to the global temperature, they effectively remove the low bias associated with wet ground (Williams et al. 1999), and provide an excellent approximation of the actual surface temperature.